Italian design and German engineering combine to give your kitchen a dazzling European flair. 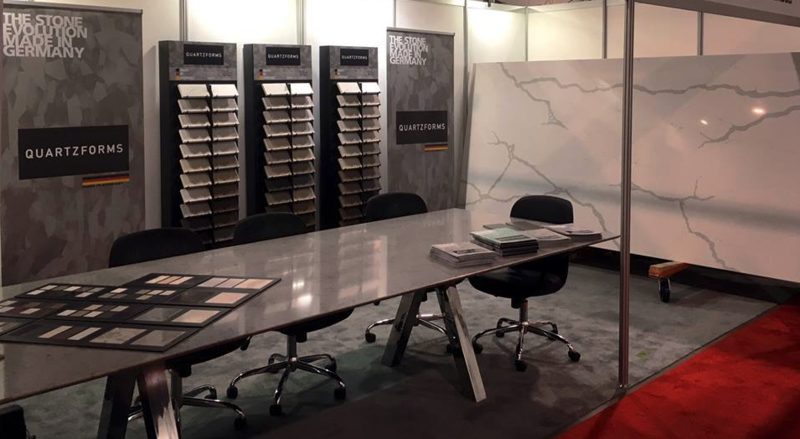 Available in over 50 colours and textures ranging from pure white to star-speckled black, delicate beige to deep red, there’s something for every taste and style in the Quartzforms range. Quartzforms are a processed stone made from 92% pure quartz, 7% resin and 1% colouring. Quartz is one of the toughest substances on the planet – it’s harder than granite – and by using high pressure and a special bonding agent, the Quartzforms team are able to transform quartz particles into incredibly durable yet stylish kitchen worktops. Where are Quartzforms worktops made? Slabs of Quartzforms are made in Germany and shipped directly to our Surrey workshop. At Surrey Marble and Granite, our on-site team do all the shaping, finishing and polishing which transforms a generic block of stone into a beautiful worktop that exactly fits your kitchen. This means that the whole process is under our control and if there are any problems (although this itself is rare) we can get them sorted out straight away. All Quartzforms come with a 10 year guarantee. What are Quartzforms used for? A great choice for kitchen and bathroom worktops, back splashes, flooring, fireplace surrounds, stairs, Quartzforms can even be used for quirkier items such as table tops and shelves. In commercial settings, Quartzforms are used in kitchens, bathrooms, spas and pools, as bar and table tops, as flooring and to create luxurious reception areas. Heat resistant – the surface is unlikely to be damaged by even a pan straight from the stove. However, the surface will absorb heat so we recommend not putting pans directly on it as it could lead to burns later. Scratch proof – Quartzforms are difficult to scratch. You can even chop food directly on a Quartzforms surface, although this is not recommended as it will probably damage your knife. Hygienic – as it is non-porous, the surface does not absorb or retain any bacteria, food particles or smells. Acid resistant – unlike marble and limestone, quartz does not react with acid so isn’t affected by mild acids such as lemon juice, vinegar or household cleaning products. As a final benefit, Quartzforms are easy to care for and easy to clean. In most cases, all you’ll need is a gentle cleaner and a damp cloth to bring your Quartzforms surface back to its original beauty. If you’d like to find out more about Quartzforms, get in touch or visit our showroom to see samples of this fabulous stone in person. ‘Go the extra mile’ is one of our founding statements here at Surrey Marble and Granite. Our team apply it in many ways, some serious, some joking, but the principle it highlights is our commitment to our customers.